Everyone daydreams at some point of owning a home abroad - perhaps some run-down farmhouse in the middle of a vineyard that they can lovingly restore and turn into their perfect holiday home in the sunshine. Indeed the latest research report from HomeAway.co.uk / Savills International has shown that for increasing numbers, the daydream has become a reality with the number of UK households owning overseas property rising from less than 200,000 to well over 450,000 in the decade from 2000 to 2010. In addition, it is estimated that 1.3 million British nationals could live overseas by 2025. 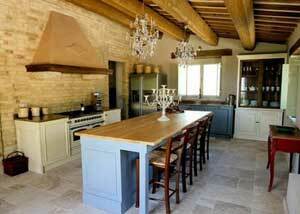 For interior designer Dawn Cavanagh-Hobbs and her husband Michael Hobbs, who together with their family run Appassionata, the dream became reality back in 2007 when they moved to Italy to renovate a ramshackle farmhouse in the pretty hilltop village of Montefiore dell'Aso. Situated in the Le Marche region, described recently by The Guardian as 'a gorgeous and affordable region to explore,' the Estate Giacomo Leopardi offered Dawn and Michael everything they were searching for. "We wanted a serious project - something that would inspire us while allowing us to work closely with local Italian craftsmen. Estate Giacomo Leopardi was perfect. We have been able to turn the crumbling buildings into two stunning houses, while ensuring that original rustic features were retained," explains Dawn. When Appassionata arrived, the farmhouse and outbuildings were derelict and unloved but Dawn recalls she instantly had 'the feeling' and knew that the estate was perfect. The first of the two houses (Casa Giacomo) was a new build on the site of a former pig sty, using traditional Italian building methods and materials, including old bricks, stone and terracotta roof and floor tiles. 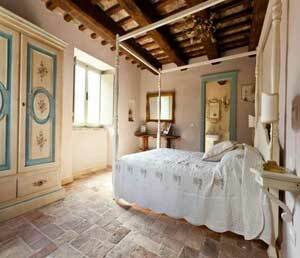 Casa Leopardi was renovated from the dilapidated 150 year old farmhouse. The original house had a typical rural Italian property setup, with living accommodation upstairs and open plan animal quarters on the ground floor, which provided the perfect place for Dawn to stable her horses for the first year before Casa Leopardi's renovation began. The outer walls of the farmhouse remain and many of the original materials were rescued and used elsewhere in the house. Although the original windows and shutters were beyond saving, a local joiner was able to replicate them for the finished house. Dawn, who never throws anything away, has stored the remains and will one day turn them into cupboards. floors. The kitchen was designed and hand-built specifically for the house and opens out onto a delightful shaded terrace, which is perfect for alfresco dining while gazing out towards the sea. The upper floors of Casa Leopardi have been turned into five en-suite double bedrooms. Three have French doors leading onto spacious outdoor terraces, while one of the bathrooms features a corner fireplace and free-standing bath. Appassionata has been careful to ensure a balance of traditional and modern touches. Thus while Casa Leopardi reflects the very essence of rural Italian living, it also has a small gym, fully equipped utility room and its own private pool. Now that the renovation work is complete, Appassionata is selling shares through fractional ownership, allowing others to be a part of the dream Italian lifestyle. All shares in Casa Giacomo have already been snapped up and only a few shares in Casa Leopardi remain available, such has been the popularity of the restoration work. One of the most time-consuming and expensive tasks of the whole project was the landscaping. Sloping farmland and a neglected 35-year-old vineyard were slowly transformed into gardens, rockeries, terraces, steps, swimming pools and a tennis court. The estate also now includes a lavender plantation, truffle orchard, replanted vineyards and olive groves, the produce of which is shared by the houses' fractional owners. "The 2012/13 grape harvest has seen the first production from our newly planted vineyards result in 1,600 bottles of wine. As the vines mature we expect the production to rise to some 5,000 bottles per year - plenty to share between just 20 owners," Michael commented on the horticultural progress.